Even though I’ve lived in Sacramento, CA for the past 11 years, I have never been to Apple Hill… until yesterday. I went with a girlfriend who just happens to be a foodie and she mapped out a route and plan for the day. 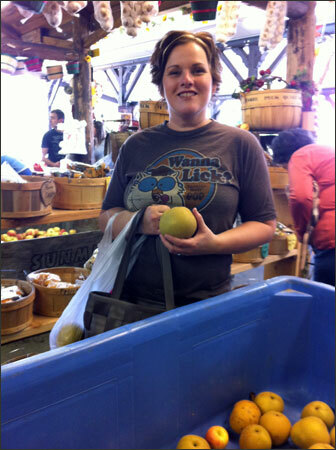 She grew up in the area and has frequented Apple Hill since childhood. It was nice to go with someone that knew the place so well. We started our day at High Hill Ranch. It was gorgeous weather and lots of people were out and about exploring the ranch. We walked around, tasted some of the good eats and took a lot of photos. Fall was definitely in the air. 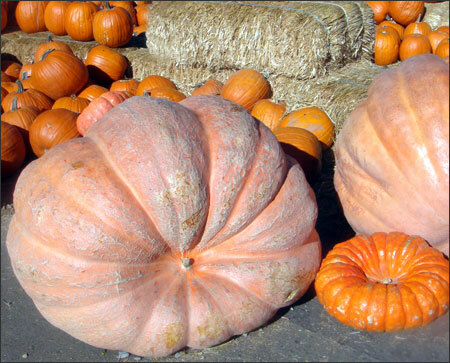 Every parent was out there with their cameras and video cameras in hand – kids were crawling all over the giant pumpkins and posing for photos in the make-shift pumpkin patch. They had an 800 lb. pumpkin/climbing structure. We grabbed some fresh cider and then headed over to the general store area to get some donuts. 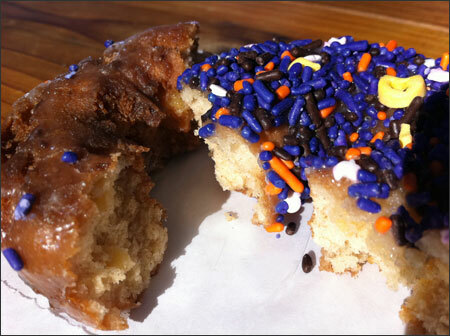 We split an apple spice donut and my childhood favorite – sprinkles – they even had Halloween ghosts on them, super tasty! 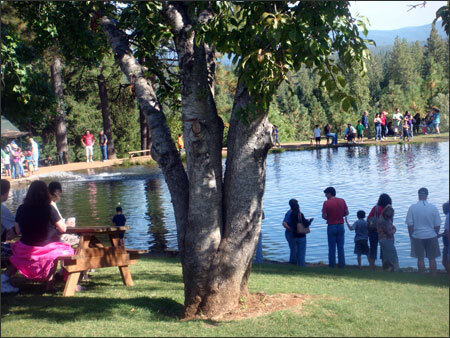 We sat at an outdoor picnic table and watched the kids fish at the trout pond. 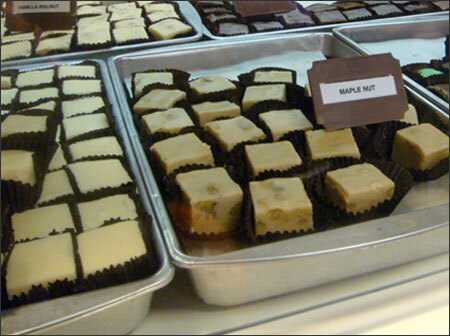 We then took a walk to the Fudge Factory Farm where I got lost in the wonderful world of chocolate. This resulted in a box filled with 2 pieces of chocolate, 1 peanut butter and chocolate, 1 chocolate and caramel, 1 pumpkin pie and 1 piece of cookies and cream fudge. I sampled the pumpkin pie flavor and it was awesome… haven’t tried the others yet. We then walked back to the High Hill Ranch store to get some apples and asian pears. There are plenty of ranches at different Apple Hill stops where you can pick your own apples – we opted for the ease of dropping them right into our bags. I got 4 different varieties of apples and look forward to snacking on them all week. I did pick up some asian pears – tried one this morning and it was really juicy. Apple butter on a whole wheat toasted pita – pure breakfast delight. 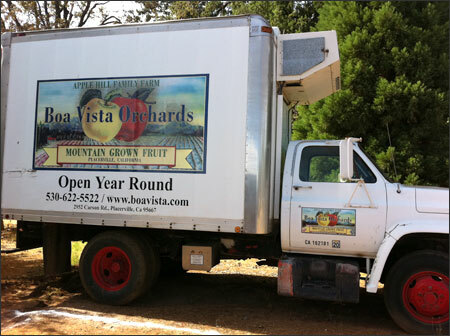 Our next stop was Boa Vista Orchards. 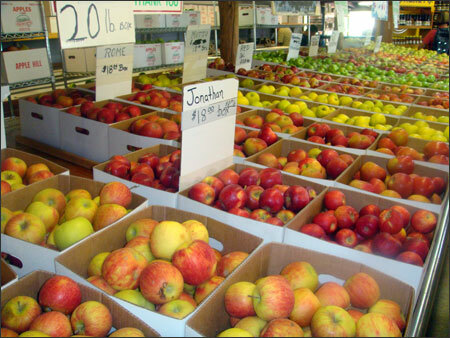 They had more of a farmer’s market – I picked up some corn, potatoes and a dutch caramel apple pie. We had a few people over last night for dinner and the pie was our dessert. It wasn’t the best pie I’ve ever had, we all felt like it was a little too dry. On the upside, the house smelled amazing after baking it. 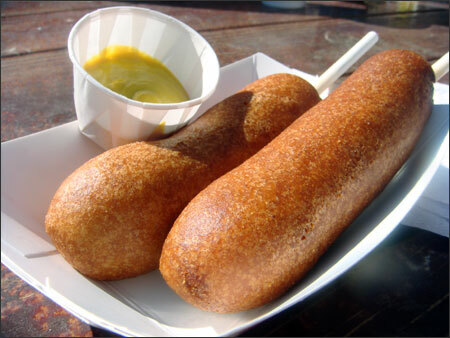 Boa Vista Orchards are also known for their corn dogs – so we waited in line for those. Donuts, apple cider, fudge, corn dogs – trust me, it gets even better. Apple Ridge Farms was another stop of the day. Our goal there was to hit the pumpkin patch, check out the hay bail maze, petting zoo and whatever else they had in store for us. Let’s just say that the vines are a bit of an illusion. 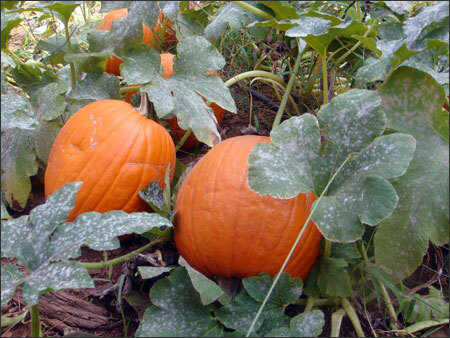 Shhh, don’t tell the kids, but I’m pretty sure they just dumped massive amounts of pumpkins right on top of the vines. Ha! – There were some green ones still attached, so it wasn’t a total scam. 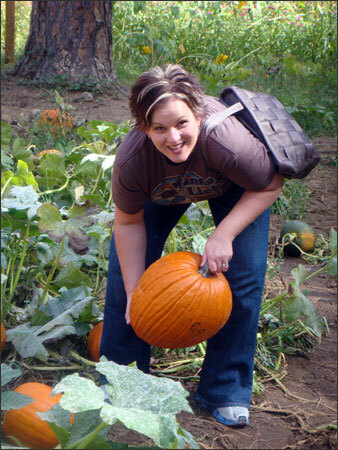 I would have needed to take out a second mortgage on the house for this size pumpkin, but I still had fun pretending. 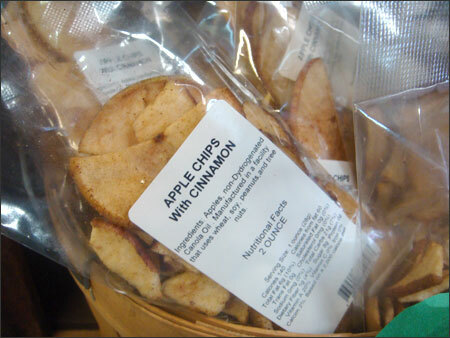 The farm also had BBQ tri-tip sandwiches, but we were more interested in the baked goods and apple items. 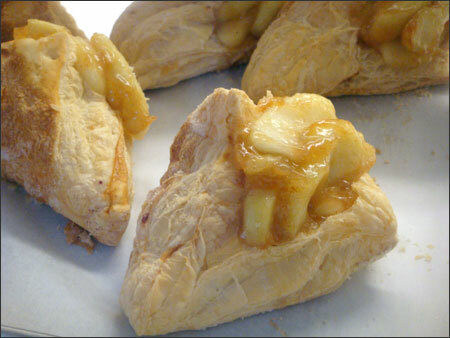 My girlfriend picked up an apple turnover to take home and I got sliced granny smith apples with piping hot caramel sauce for us to share. and more yum…The sign of good caramel is most definitely sugar coated teeth. 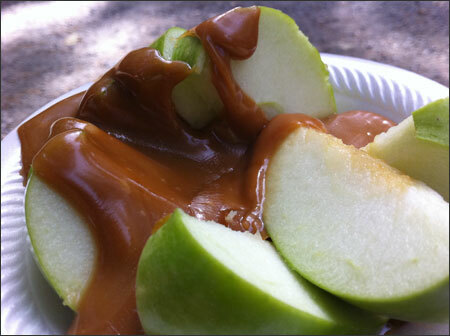 Yep, check… This my friends was the perfect way to eat a caramel apple. No stick, no sticky face – it exceeded all expectations. 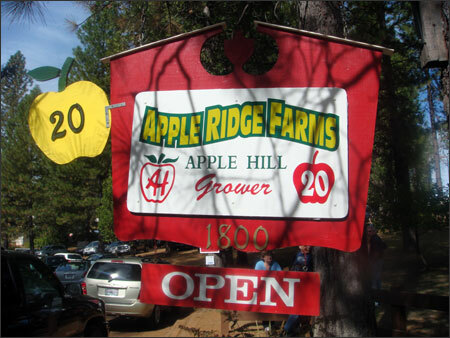 I was so happy that it was perfect weather (high 70’s) for my first visit to Apple Hill in Placerville, CA. 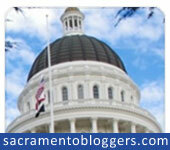 Today was filled with overcast skies and rain – pretty much love that too. I spent the late afternoon thumbing through cookbooks looking for soup recipes and Dan made some wheat berry bread. It was a food filled weekend for sure. 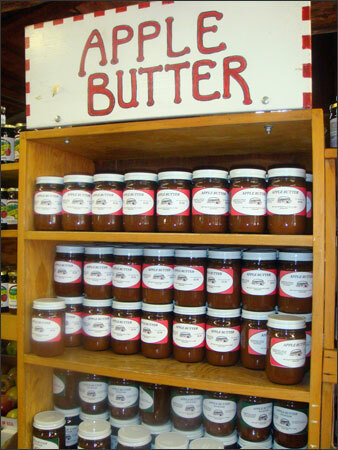 Wow, we have a great apple barn/store/pumpkin patch near by but Apple Hill beats it like no other. I love the Fall weather… and all that comes with it. The boys and I went to the apple farm and shared cider donuts and cider this weekend too. I sure wish Apple Hill was near us!